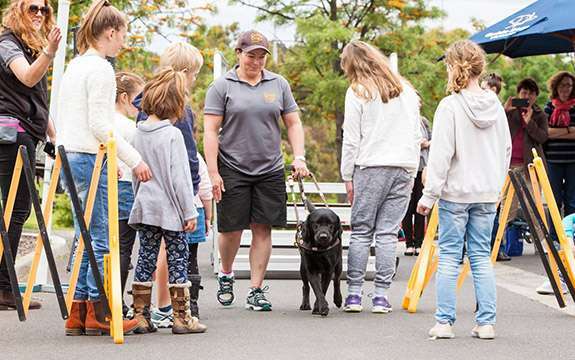 Conducted for Guide Dogs Victoria by Swinburne researchers, the project explores the benefits that people with low vision or blindness experience from a guide dog. The benefits include promoting social participation, managing mental and physical health, and developing the confidence to try new skills and experiences. Swinburne researchers Professor Denny Meyer and Dr Lil Deverell undertook the year-long investigation. "To date, attempts to evaluate the impact of guide dogs have been limited by lack of clarity around what to measure," Dr Deverell says. "Guide Dogs Victoria wanted to hear from clients about what they gain from having a guide dog. This research provides us with a benchmark that we believe could be used across the world to measure outcomes in the years to come." Dr Deverell says social and emotional vulnerability is a key issue faced by many Australians with blindness or low vision. "The guide dog is a full-time companion. It refuses to be ignored at home, and provides a great talking point when out meeting new people." Close to 65 per cent of those surveyed mentioned mental and physical health issues, including chronic pain, anxiety and depression. Dr Deverell says the therapeutic impact of a guide dog tends to remain hidden. "One client reported that when his chronic pain is minor, the dog wants to play with him, providing a distraction from discomfort, but when the pain becomes severe the dog comes to sit by his side providing comfort and company." Guide Dogs Victoria CEO Karen Hayes says guide dogs are much more than navigation dogs, enabling people with blindness or low vision to focus on living instead of walking. "This research is incredibly exciting for us, as it validates that guide dogs are life-changing," Ms Hayes says. "Many of us think of a guide dog as a Labrador in harness guiding the handler to a destination, but these dogs also provide a real sense of security, companionship and confidence that cannot be matched." The preliminary findings form part of a five-year research project between Guide Dogs Victoria and Swinburne.